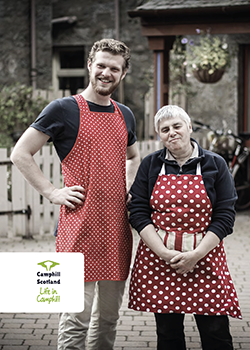 Loch Arthur is a vibrant and forward looking Camphill community of people sharing life and work with adults with learning disabilities. There are eleven houses that are home to a population of around 75 people, 28 of whom have a supported tenancy. We have families that have been here for a long time as well as some people who have recently joined us to make their home here. We are supported by 20 short term volunteers, who come from many different countries and stay for 6-12 months as well as a number of employees working in our shop, café and in our offices. Loch Arthur Community is now in its 35th year and nestles under Lotus Hill in a beautiful valley in South West Scotland. Our 550 acres include the Loch which gives us our name, a large forest and areas of outstanding natural beauty. Our work areas include a bio-dynamically run farm, a large fruit and vegetable garden, creamery, bakery, craft workshops and a farmshop and café. We also share a rich social, cultural and spiritual life. Has good communications skills and is able to work well as part of a team.